Our Exhibition Daybed is close to the size and geometry original design. The frame is constructed from premium grade hardwood (walnut or ash) - 4" wide x 1.5" thick - with 3 finish choices: medium walnut, dark walnut, or ebonized black ash. The stainless steel legs are hand-polished to a high luster finish, are 1.5 inches in diameter and have a smooth plastic foot. There is a choice of seat height: either the standard 15" height (using 9 inch legs) or 18" seat height (using 12 inch legs). 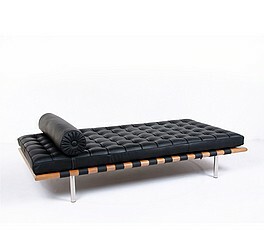 The cushion surfaces consist of 78 individual top-grain, Italian leather panels; each piece is cut and hand-sewn using a hand-rolling welting technique not found in other versions on the market. Inside the cushion is high resilient - high density polyurethane foam. The cushion is supported by heavy saddle leather straps screwed to the frame and whose top match the leather color. The bolster pillow features tufting at each end and is attached with buckled straps. The bolster measures 8 inches in diameter by 36 inch long. Shown here in Autumn Tan leather.